Scientists are still building ever more powerful particle accelerators. The Large Hadron Collider is supposed to come online this year and is expected to make some major discoveries. For comparison the most powerful accelerator at the time of this article was about 6 bev. Or 6 billion electron volts. The LCH will collide two beams each with 7 tev (trillion electron volts) making it about 20,000 times more powerful. If you haven’t seen pictures of the ATLAS detector yet, you really should check them out. It really is an engineering marvel. Plus when it was being built it looked like some kind of trans-dimensional portal. By Thomas E. Stimson, Jr. THE RESEARCH TEAMS that discovered atomic energy are probing deeper into the heart of the atom today and there’s a good chance that other exciting, though unpredictable, discoveries will be made. Basically, the physicists are trying to find the true fundamental particles of which the atom (and hence the universe) is composed. Once it was thought that the atom itself answered this definition; now it is known that the atom contains a bundle of assorted particles or bits of energy in its structure. To learn the nature of these ultimate particles the physicists have built a whole new array of tools far more powerful than the cyclotrons of 10 years ago. 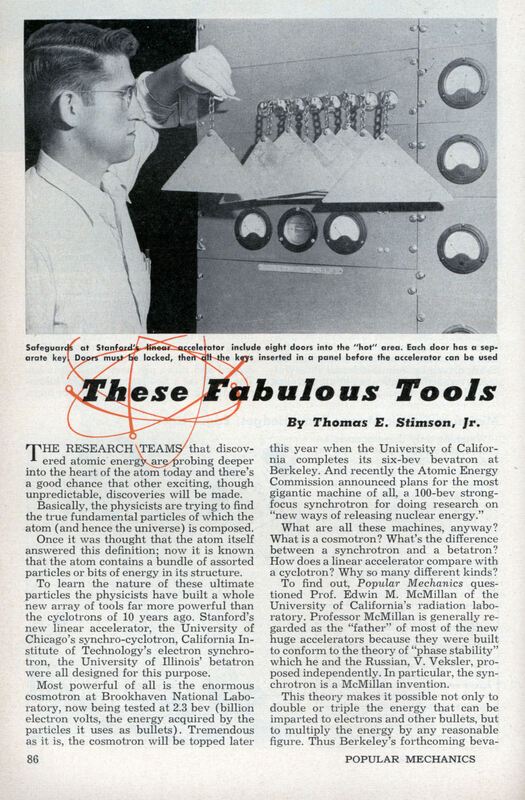 Stanford’s new linear accelerator, the University of Chicago’s synchro-cyclotron, California Institute of Technology’s electron synchrotron, the University of Illinois’ betatron were all designed for this purpose. What are all these machines, anyway? What is a cosmotron? What’s the difference between a synchrotron and a betatron? How does a linear accelerator compare with a cyclotron? Why so many different kinds? 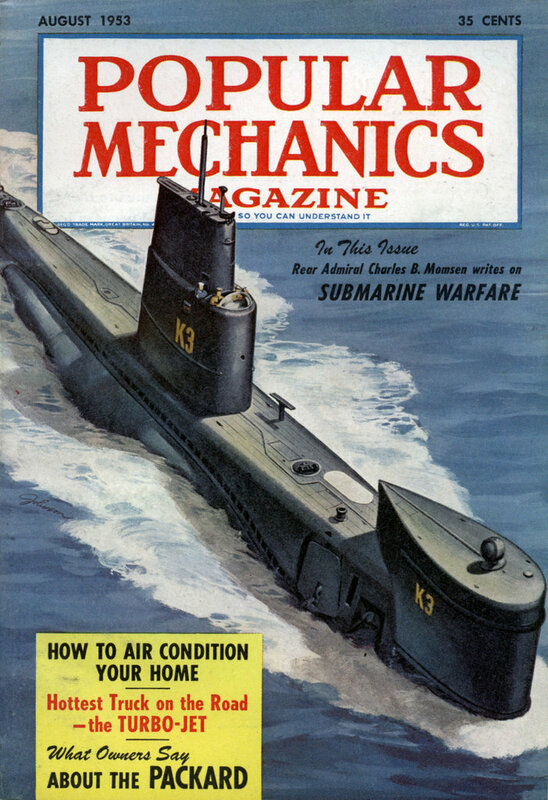 To find out, Popular Mechanics questioned Prof. Edwin M. McMillan of the University of California’s radiation laboratory. Professor McMillan is generally regarded as the “father” of most of the new huge accelerators because they were built to conform to the theory of “phase stability” which he and the Russian, V. Veksler, proposed independently. In particular, the synchrotron is a McMillan invention. This theory makes it possible not only to double or triple the energy that can be imparted to electrons and other bullets, but to multiply the energy by any reasonable figure. Thus Berkeley’s forthcoming bevatron will be able to accelerate protons to more than 60 times the highest energy that could be hoped for with one of the cyclotron designs of the 1930s. Professor McMillan is also one of the co-discoverers of plutonium and neptunium. In prewar cyclotrons, heavy particles could not be accelerated much above 100 mev (million electron volts) because the increasing weight of the particles (a particle gains mass as it gains energy, according to the law of relativity) caused them to lag behind and fall out of step with the regularly spaced electrical pushes. With phase stability all this is now possible. Professor McMillan’s idea was to synchronize the accelerating device with the particles. The machine would remain in step with the particles either by varying the magnetic field or retiming the energy pulses, or both. In the case of the 184-inch cyclotron that was under construction at Berkeley at the time, changes were made (by retiming the energy pulses) permitting it to keep step with the particles it was accelerating. As a synchro-cyclotron, the machine has a power of 350 mev, over twice its original-design power. The synchrotron, in which McMillan’s theory is applied by varying the magnetic field, is essentially a machine for accelerating electrons. With various changes, however, it can be used to accelerate protons and other heavy particles. A synchrotron consists of a large doughnut-shaped vacuum chamber contained in a magnetic field. The machine is operated first as a betatron or induction accelerator and then, as the electrons begin to lag, the machine is operated as a synchrotron. Electromagnetic force is built up in the magnet units to jerk the electrons around to the gap at which they receive their next charge from a high-frequency oscillator. The cosmotron and the bevatron are simply “local” names (used at Brookhaven and Berkeley respectively) for huge synchrotrons designed to accelerate protons as bullets. When completed, the bevatron will have a magnet weighing about 10,000 tons with a diameter of 110 feet. It will represent an investment of nearly $10,000,000. Linear accelerators do the same job as the circular accelerators and their energy depends upon the length of their tubes, among other things. Biggest to date is the one-bev electron linear accelerator (now being tested at partial power) at Stanford University. This machine has a 200-foot-long vacuum tube that eventually will be extended another 20 feet. Electrons are accelerated to increasingly higher speeds as they move down the tube by impulses of radio frequency energy provided by klystron power tubes spaced at 10-foot intervals along the line. Each tube delivers more than 15,000,000 watts at full power and if they could be operated constantly instead of in millionth-second flashes, 20 of them could light a city the size of San Francisco. The University of Minnesota, meanwhile, is testing a new proton linear accelerator that has a design power of 68 mev. There are probably 100 accelerators the world over being used for nuclear research and in addition there are several being used for nuclear research and in treating deep-seated cancer. Acceleration machines are ideal sources for producing high-energy X rays. Conventional X-ray equipment is adequate for treating cancer at or just below the skin but may cause X-ray sickness and burns when used for deeper penetration. The high-energy X rays, on the other hand, apparently can reach cancerous growths within the body without injury to overlying tissues. Most powerful of the medical accelerators is a 70-mev synchrotron at the University of California’s School of Medicine in San Francisco. Next is the 20-mev betatron at the University of Illinois. A different type is a six-mev accelerator at Stanford. Prof. Edward L. Ginzton, director of Stanford’s microwave laboratory, believes that linear accelerators of this power could be manufactured commercially for little more than the $15,000 price tag of conventional 200,000-volt X-ray machines. At a cost like this almost every hospital could afford this far more powerful X-ray source. In a few years, probably, physicists will be watching the completion of an accelerator far more powerful than they had dreamed. This is the 100-bev strong-focus synchrotron recently announced by the Atomic Energy Commission. It appears to be practical because of the discovery of a new principle for focusing by strong magnetic fields; this was developed by a research team at Brookhaven. It is estimated that its magnet and tube will be close to half a mile in diameter. What could be expected of an accelerator like that? In the first place, it undoubtedly would substantiate many of the findings that our present large accelerators are expected to help make in the next few years. Some speculate on the possibility of making “reversed matter” when 100,000,000,000 electron volts of energy are available. Electrons normally have a negative charge and yet physicists already have created positive electrons, called positrons. With great power it might be possible to create negative protons in the nucleus. An atom of “antihydrogen” would have a positron revolving around a negative proton as the nucleus. Already, however, with their present equipment the physicists are duplicating under controlled laboratory conditions some of the nuclear disintegrations that occur in the medium range of cosmic radiation. Mesons, for instance, were first observed in cosmic-ray studies; a number of the newest accelerators are powerful enough to create them at will. In fact, several types of mesons have been “manufactured” and identified. The mysterious V-particles, recently detected in cloud-chamber photographs of cosmic-ray disintegrations, also may prove to be associated with the nuclei of atoms. Right now, there’s no telling what new information will be gained from research with the powerful new tools. But the Atlas looks like a remake of the 1960s “The Time Tunnel”. I remember it had a cool theme.